In this talk, we will see through the large voxel acquired from conventional fMRI method to decipher the contribution from distinct vascular components to fMRI signal. The individual arterioles and venules penetrating cortices were directly mapped based on the blood in-flow effect and fast T2* decay of the de-oxygenated blood. Distinct blood-oxygen level dependent (BOLD) and cerebral blood volume (CBV) fMRI signal was detected on individual venules and arterioles with 100ms temporal resolution. This fast sampling rate allows us to identify the activity-evoked hemodynamic signal propagation through cerebrovasculature in the deep cortical layer of the somatosensory cortex. In addition, I will show you our recent progress on light-driven fMRI with optogenetics and fiber-optic mediated calcium recording methods through GCaMP6. We are aiming to implement fiber-optic mediated optical methods to makes fMRI more suitable for mechanistic studies on neurovascular coupling. At last, I will present our recently developed MRI-guided robotic arms to target deep brain nuclei in rats. Yu X*, Qian C., Chen D-Y, Dodd S, and Koretsky A*, Deciphering laminar-specific neural inputs with line-scanning fMRI, Nature Methods, 11, 55–58. (2014) * corresponding authors. Xin Yu obtained his bachelor degree from Wuhan University in 2000. Then, he went to the USA for a master training in Seton Hall University. 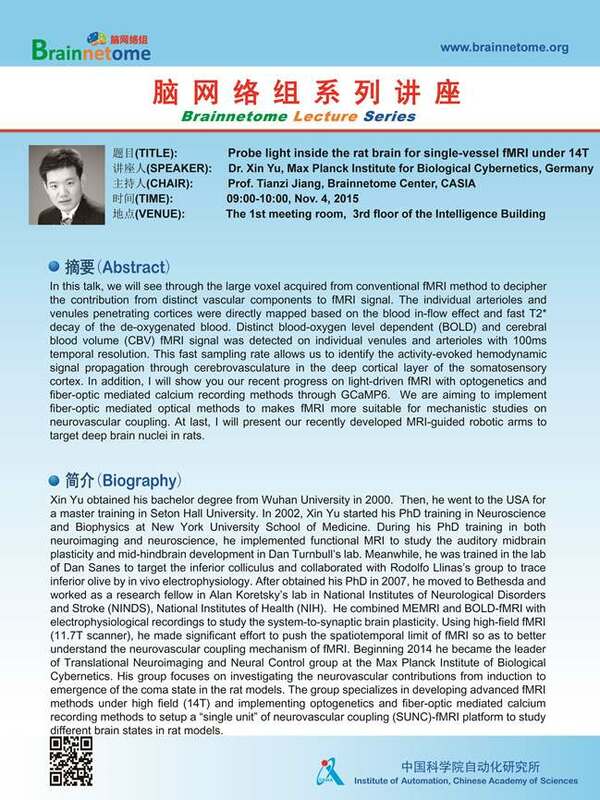 In 2002, Xin Yu started his PhD training in Neuroscience and Biophysics at New York University School of Medicine. During his PhD training in both neuroimaging and neuroscience, he implemented functional MRI to study the auditory midbrain plasticity and mid-hindbrain development in Dan Turnbull's lab. Meanwhile, he was trained in the lab of Dan Sanes to target the inferior colliculus and collaborated with Rodolfo Llinas's group to trace inferior olive by in vivo electrophysiology. After obtained his PhD in 2007, he moved to Bethesda and worked as a research fellow in Alan Koretsky's lab in National Institutes of Neurological Disorders and Stroke (NINDS), National Institutes of Health (NIH). He combined MEMRI and BOLD-fMRI with electrophysiological recordings to study the system-to-synaptic brain plasticity. Using high-field fMRI (11.7T scanner), he made significant effort to push the spatiotemporal limit of fMRI so as to better understand the neurovascular coupling mechanism of fMRI. Beginning 2014 he became the leader of Translational Neuroimaging and Neural Control group at the Max Planck Institute of Biological Cybernetics. His group focuses on investigating the neurovascular contributions from induction to emergence of the coma state in the rat models. The group specializes in developing advanced fMRI methods under high field (14T) and implementing optogenetics and fiber-optic mediated calcium recording methods to setup a "single unit" of neurovascular coupling (SUNC)-fMRI platform to study different brain states in rat models.